Cruising Passions is a free dating & social networking site for singles who love cruising. Find other singles who love cruising. Enjoy free cruise chat. Who knows, maybe you'll even meet someone special for a fun cruise. Join for free and take advantage of free email, chat, forums and more. Single and interested in finding a fun partner to enjoy a beautiful cruise? 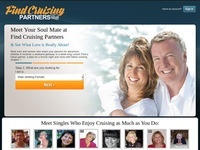 Find Cruising Partners was designed specifically to connect singles interested in cruising. If you enjoy cruises, but would prefer sharing one with an interesting companion, then this is the site for you. Join for free and see if your cruising soulmate is online now. Single Travel Lovers is an online dating site specifically for singles who enjoy vacations, cruises and traveling in general. If you are looking for someone who might enjoy a fun get-away weekend (after getting to know one another, of course), this is the site for you. Traveling Passions is a free dating site for singles with a love of travel. Find other singles who love to travel. Enjoy free travel chat. Who knows, maybe you'll even meet someone special for a fun vacation. Join for free and take advantage of free email, chat, forums and more. "SinglesCruise.com has been booking singles cruises successfully since 1991. We do have the reputation of organizing the best and most successful "singles" cruises with the largest turnout. Visit our site for the best value in singles cruises."